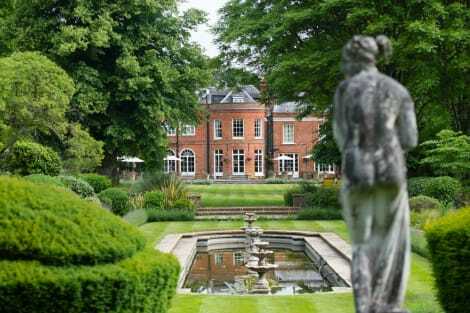 This lovely hotel is located in Ascot. This cosy establishment guarantees a quiet stay as it counts with just 15 units. Pets are not allowed at this establishment. Stay in one of 272 guestrooms featuring LCD televisions. Complimentary wireless Internet access keeps you connected, and satellite programming is available for your entertainment. With a stay at Macdonald Berystede Hotel, you'll be centrally located in Ascot, a 4-minute drive from Ascot Racecourse and 13 minutes from Legoland. This 4-star hotel is 8.1 mi (13.1 km) from Windsor Castle and 9.3 mi (15 km) from Thorpe Park. Located in Ascot, Royal Berkshire, an Exclusive Venue is in the historical district, a 5-minute drive from Virginia Water and 9 minutes from Legoland. This 4-star hotel is 6.7 mi (10.8 km) from Windsor Castle and 7.2 mi (11.6 km) from Frogmore House. Stay in one of 10 guestrooms featuring flat-screen televisions. Complimentary wireless Internet access is available to keep you connected. Bathrooms have showers and hair dryers. Conveniences include phones, as well as desks and coffee/tea makers. Set within the English county of Berkshire, the small town of Ascot is known across the world, thanks to its long and distinguished association with the sport of horse racing, which began in 1711 when Queen Anne founded Ascot Racecourse. Picturesque countryside, fine pubs and restaurants, walking opportunities and a variety of nearby attractions are all on offer. One of the main attractions in the area is, of course, Ascot Racecourse which hosts nine of the UK's 32 annual Group 1 horseraces. The track is located just to the north of the village and plays a major role in the life of the area. June's Royal Ascot race meeting is a major event in the UK sporting calendar and features The Gold Cup, regarded as the venue's most famous horse race. More than half a million people visit the town each year and finding space in Ascot hotels during major events requires some forward planning. Outside the racetrack, there's lots to keep visitors entertained within the town and the surrounding area, especially golf lovers. Lavender Park Golf Centre is situated to the west of Ascot, while Royal Ascot Golf Club lies a short distance to the north. Thrill seekers looking for a little more adventure might want to head further afield to experience the rollercoasters and rides at Thorpe Park near Chertsey – one of the most popular theme parks in the UK. The high-adrenaline Go Ape treetop adventure course on the outskirts of Bracknell is also just a 10-minute drive from the centre of Ascot. The wonderful countryside around Ascot attracts many walkers to the area and there are plenty of routes nearby to suit all abilities. Consider taking a relaxed stroll close to the racetrack at Ascot Heath, or perhaps around nearby Windsor Great Park, where you'll also be close to the popular attractions of Legoland and Windsor Castle. With plenty of restaurants, pubs, cafés and hotels in Ascot and the surrounding area, you'll have no problem finding a dining option to suit. Opt for a traditional pub setting at the 200-year-old Duke of Edinburgh inn on Woodside Road or the Thatched Tavern to the east of town. Treat yourself to afternoon tea at The Drawing Room in Coworth Park, or perhaps settle for good old fish and chips at Ocean Blue in Sunninghill.